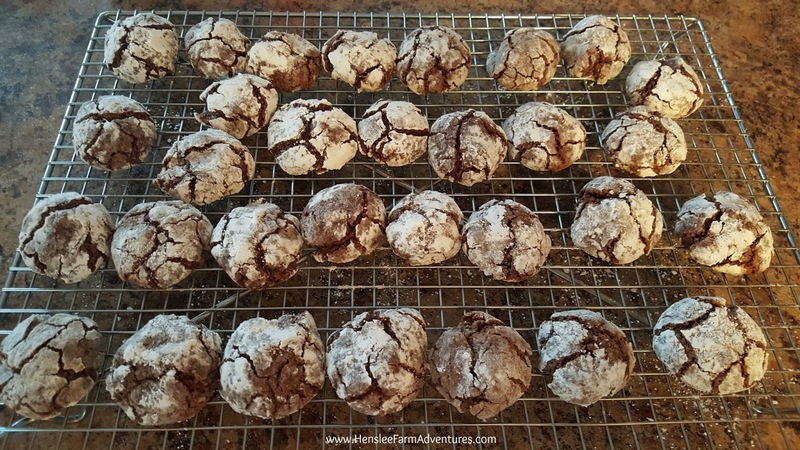 25 Days of Giving Update and a Cookie Recipe! Well my December challenge has been more of a challenge for me than I originally thought. I mentioned in one of my previous posts that the giving part was not going as planned. To be honest I'm not sure what I really thought would happen with this challenge. I guess I was thinking that everyday I would be volunteering or donating items to a charity, giving money, and making the world a better place. What I have found is that it is the small giving that can mean so much. I do believe that it is important to donate food and gifts to families in need, and that I have done. I also believe that it is important to support your favorite charities with monetary donations. That I have done also, but it is the little things that sometimes we forget to do that can make giving easy, and life so much better. Allow someone to go in front of you in the check-out line for absolutely no reason. Pay for the person behind you in the drive-in lane at a restaurant. Volunteer to help when asked. Smile and say hello to people you don't know. When your child has to bring money in for a class party, give extra in case a student can't afford it. If you shop at ALDI, give your cart to someone without asking for the quarter. Instead of yelling at the person who just cut you off in traffic, pray for them instead to get to their destination safely. Doing all of these and more can really make a difference. This is giving of the best kind...the giving of kindness and it can make someone's life a little brighter. Now for the cookie recipe. This recipe is one that I made based on a recipe that I found at Eating on a Dime. 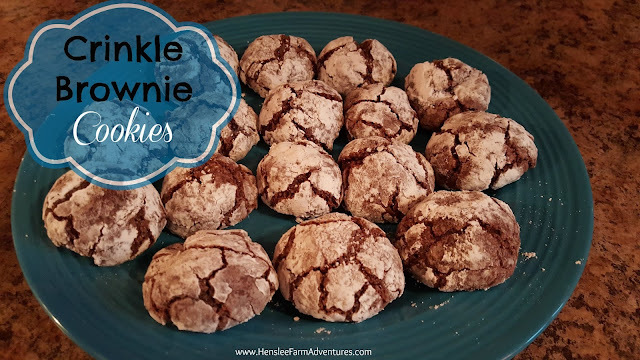 I needed a good recipe for our church's cookie reception and it needed to be quick, easy, one that I had all the ingredients for, and something different than chocolate chip. This recipe I found sounded great! Plus they were quick to make and easy. 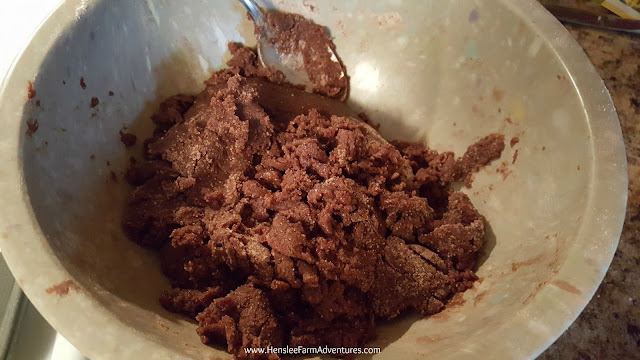 The one problem is that it called for a brownie mix, and I don't normally use store bought mixes. In fact I make my brownies from scratch (I see another recipe post in the near future). So I decided to use my brownie recipe to make a "mix" and I had to tweak a few other things, but I was able to make these delicious cookies from scratch and they were just as easy as using a store bought mix. First sift the dry ingredients together. If you don't have a sifter (really you should) just put the dry ingredients in a bowl and whisk together well. Next add in the wet ingredients. I did not add the wet ingredients together and then combine, I just threw the eggs, oil, and vanilla right into the dry ingredients. You can see how thick it is! Then mix this all together. I will say that I started mixing this with a spoon. I knew it was going to be thick, but this is super thick. I soon abandoned the spoon and dove right in with my hand. Carly making the cookie balls...please forgive my messy kitchen! 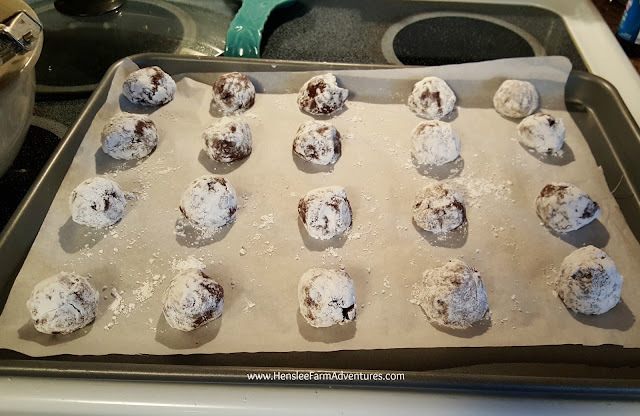 Once it is mixed well, start making balls with the dough. I used my cookie scoop to get uniform cookies. 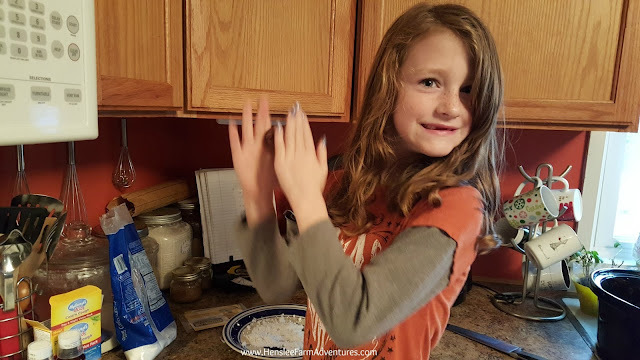 Then roll the dough ball into powdered sugar. This is where my little girl helped. 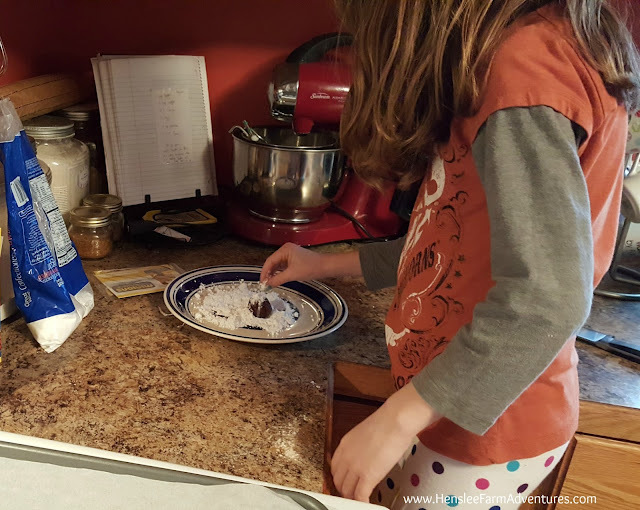 She loved making the dough into balls and rolling them into the powdered sugar. And I love being able to cook with her and pass on my knowledge! Carly rolling the balls in powdered sugar. Once you are done, then bake them in a preheated 350°F oven. The original recipe said for 8-10 minutes, but her cookies must have been much smaller than mine, or perhaps my oven temperature is a little off. Not sure, but I had to bake my cookies for at least 18 minutes before they were done. I would suggest to start checking them around the 10 minute mark. The cookies were a huge hit at our church function and they were soon gone. I was so glad that I saved a few for us at home. I will definitely be making these cookies again. They would be perfect for a cookie exchange or if you are planning on making some treats as gifts during the holidays. Cooling on the rack, it was hard to keep everybody out of them! I hope you enjoyed this recipe and if you try it, please let me know in the comments below what you think. If you would like a printable version of the recipe, click HERE.